While it’s safe to say that most of my far-flung adventures have started at an airport, my visit to South Carolina went into suspended animation in a pub in London, where I sat drinking a pint of Guinness, wondering what on earth was going on. The night before my scheduled flight to Palmetto Bluff, deep in America’s ‘Deep South’, I’d rehearsed the usual routines, which involve checking my camera gear, locating my passport and trying to get some sleep, which I know will never happen because you never do the night before a long haul flight. What lay ahead, I thought, was a perfectly normal adventure. As I rattled along the open-air section of the Piccadilly line on the approach to Heathrow airport, I decided to check my smartphone for any messages that might be important, and sure enough, there was one from my hosts in South Carolina, the gist of which was that my trip had been cancelled. As Hurricane Irma threaded her murderous path northwest across the Caribbean, the US eastern seaboard had been put on alert. This alert, it transpires, was serious enough for the South Carolina authorities to issue evacuation orders, and Palmetto Bluff was under such an order. And so, after what had seemed like hours on the Underground I disembarked (I think at Boston Manor), changed platforms and got a train back to the metropolis of London, where I sat recharging the batteries and wondering what to do next. It was to be six weeks before I attempted the journey again. Thankfully, the destruction in South Carolina, while serious, hadn’t been life threatening. By the time Irma had arrived, much of her energy had blown out and apart from ripping roofs of buildings and tearing up hundreds of trees, the incident had been innocuous. 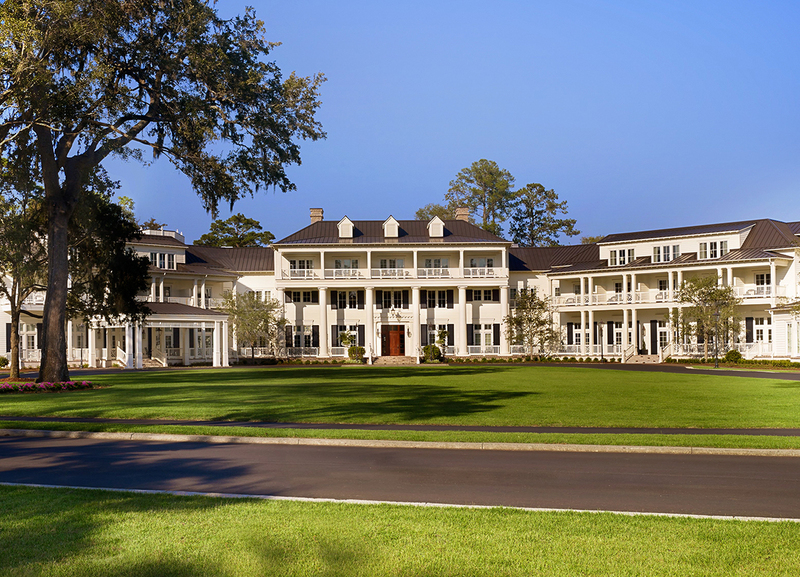 My friends at the Montage Palmetto Bluff Hotel were pleased to reassure me that everything that needed to be nailed back down was now in order, while all the fallen trees had been hauled away. In fact, the Bluff was looking as pretty as a picture, they said. All it needed was for me to get there with my camera so that we could get on with the business of producing a travel article for one of those swanky London style magazines that are read by people who drive Land Rovers in Kensington and wear green wellingtons in Chelsea. My second attempt to reach the Low Country was successful and as I changed planes at Charlotte for an internal flight to Savannah an hour away, I started to see what people meant about the hospitality and civility of the people of America’s Deep South. For here I was, in an airport that not only supplied enough seating for everyone, but much of it in the form of rocking chairs. Apparently, the rocking chair is an integral part of local life, the custom being to sit on your porch with your neighbours, rocking away the hours in gentle conversation. They even have a word for it: ‘porching’. And as antiquated as it might sound, over the following week I came to approve of the pastime, especially as you don’t have to sit on anyone’s porch for long before a bottle of bourbon appears. But all this was in the future as I drove in the dark from Savannah to the Bluff, occasionally catching a white-tailed deer in the headlights. Despite driving at night I could sense that this was different from the America I knew, which until this time had been restricted mostly to the human termite mounds of New York City and the zombified trendiness of the Californian west coast. When I awoke early I had the feeling that not only had I been transported in place, but in time. 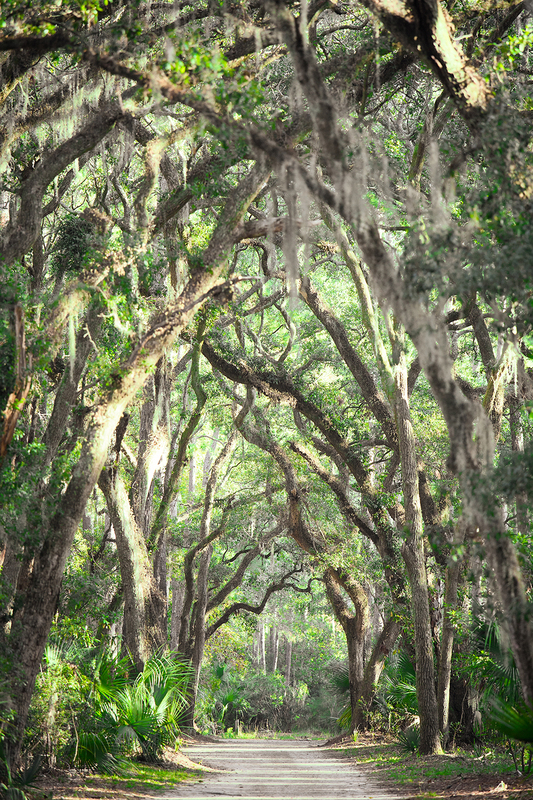 The Bluff, with its traditional architecture and elegant trees positively dripping with Spanish moss, seemed to be straight out of the pages of Gone With the Wind that is set in the nearby state of Georgia. “What was it that had gone with the wind?” I naively asked my guide Meredith. It turns out that it was the traditional way of life. And so it was nice to be in a place where, despite having just had a hurricane whip through it, not everything connected to its more genteel past had disappeared. Everyone calls you ‘sir’ and after a while, as self-conscious as it makes you, you start to call everyone ‘sir’ or ‘ma’am.’ And just like their cooking, in this part of the world everything is done slow-and-easy style. It is the way of things. 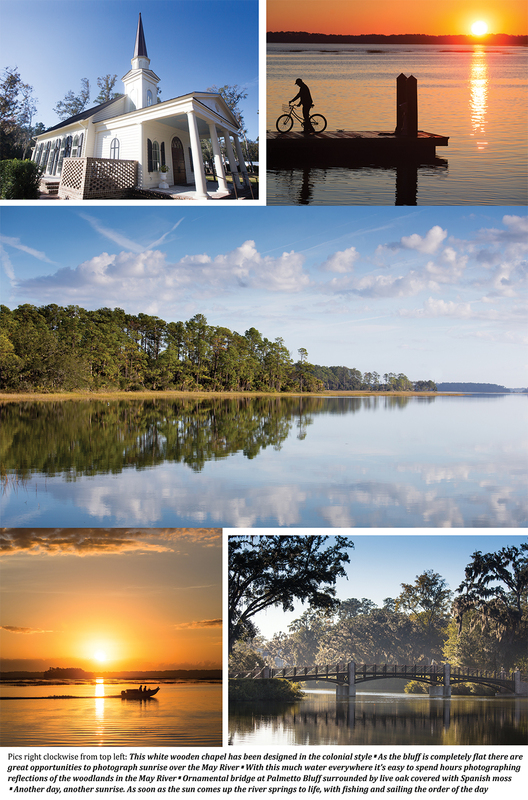 Apart from being home to the wonderful Montage hotel, Palmetto Bluff is a village settlement, a wildlife conservation area, an area of outstanding beauty and an historical archive all in one. It is one of the oldest parts of the United States in that some of the first humans to arrive in America lived off land and sea here, hunting and fishing. Dr Mary Socci, head of archaeology at the Bluff, told me that stone projectile points (‘arrowheads’) dating back to 10,000 BC have been found. I spent hours with Mary learning the story of the land here, where forest and river meet in the marshes, combining to make a freshwater delta landscape that is teeming with wildlife. There is always one thing that you take away from any trip to somewhere off the beaten path, and for me this time it was the trees. From the porch in front of the house where I was staying – the Montage Hotel doesn’t just do rooms, you can also hire an entire house – I could see dozens of ancient oaks festooned in moss. These trees are reflected in ornamental lakes along with the white wooden colonial architecture to create endless photo opportunities, and so I photographed them endlessly. Further afield I spent a few days cycling along the trails overhung by great archways of green leafy branches through which only the strongest sunlight could penetrate. The forests are full of birds, but to photograph them properly you have to get out in the open to the water’s edge, and so it’s convenient that the Bluff, which covers 200,000 acres of protected land, is a maze of waterways, the main one of which – the May River – is home to egrets and herons as well as bottlenose dolphins. In the countless creeks and slow-moving bayous there are alligators and plenty of them. One of the first things you’ll hear in South Carolina is that alligators aren’t crocodiles. They have a reputation, quite unlike their larger cousins, for being quiet and sensible. They are protected to a level that borders on molly-coddling and they certainly won’t attack you unless you do something stupid, such as feeding them. They can be irritating in that they sunbathe in roads, swim-ming pools and gardens. But, by and large, they are harmless crocodilians that, to employ the cliché, are more afraid of you than you are of them. After spending a hot thirsty morning trying to take interesting photographs of alligators (not very easy, as they are of an indeterminate metallic colour and don’t move so much as an eyelid for hours on end), I cycled back the handful of miles to Palmetto Bluff. As I pedalled along I noticed half a dozen bald eagles soaring in the golden air. Deciding that I’d never seen any-thing quite so quintessentially American in my entire life, I dismounted and walked along a riverbank, eyes and camera pointing upward. And although I didn’t quite tread on the fully-grown alligator asleep before me, I was brought up pretty sharpish only a few feet from a head-on collision. At moments like this you forget about how safe they are, and all you can think of is that this might be the one that wants revenge for all those handbags, belts and shoes. My riverine friend eyed me with suspicion, evidently unwilling to call the first shot. Then of all the bizarre things you can imagine, I saw an old man out walking his dog. After which, another dram of bourbon seemed to be the order of the day. 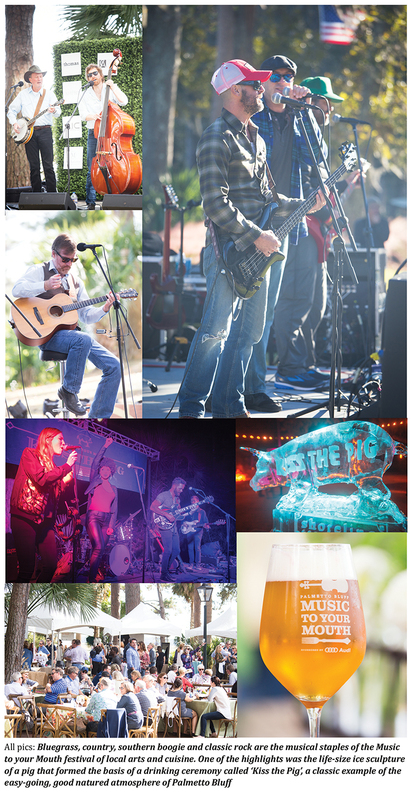 So it was to my good fortune that the rescheduled visit to Palmetto Bluff was taking place right in the middle of a food and drink festival called Music to Your Mouth, soundtrack courtesy of the best exponents of southern boogie blues-rock and lightning fast finger-picked bluegrass. The food was local and traditional – grits and gravy, bison steaks, more bourbon and even some southern-style fried alligator (which tasted like muddy chicken and made me feel very ungrateful to the alligator that had thought better of eating me earlier.) The highlight though was the whole roasted pigs. Such is the cult of the pig here that in the evening an enormous ice sculpture of an gigantic porker is bought out and guests are offered the chance to ‘Kiss the Pig’. This honour involves tipping bourbon into somewhere adjacent to its hind quarters, from where the liquor makes its way ‘upstream’ before emerging from its mouth, from where you drink. When offered the opportunity to kiss the pig for myself, in the grand time-honoured tradition of journalists the world over, I made my excuses and left. Now I wish I hadn’t. As I traced my way back to London I had time to reflect on the fact that I’d experienced a part of sleepy small town America that so few of us will ever get to see. We read all the time of places where time stands still, but here in South Carolina’s Low Country it’s no exaggeration to say that, while it might not have ground to a halt, it moves as slowly as the alligators in the sleepy creeks and bayous. 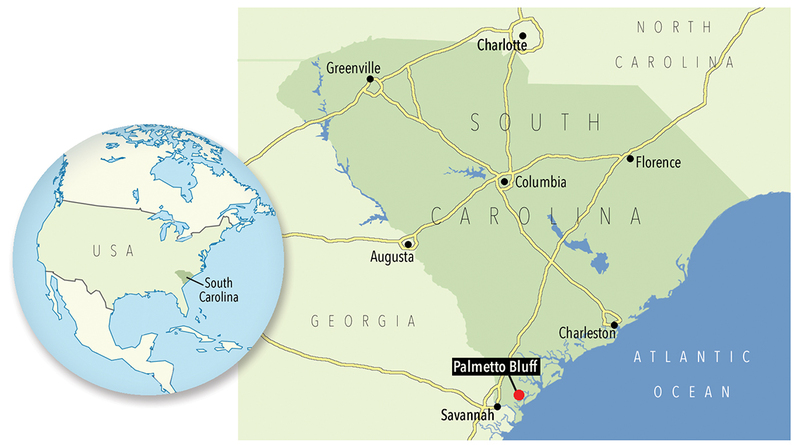 Located in the heart of South Carolina’s ‘Low Country’, Palmetto Bluff is the largest waterfront property on the East Coast of the USA. It is evolving as a residential community and conservation preserve with 32 miles of riverfront and extensive nature trails. The village centre has boat storage and canoe club, as well as the AAA Five Diamond Montage Palmetto Bluff resort and spa. Montage’s furnished branded real estate offerings start at $1.4M. Visitors can enjoy the Jack Nicklaus Signature Golf Course, as well as outdoor activities, including a state-of-the-art equestrian centre, shooting club, racquet club, croquet and bocce courts, boating, river cruises, kayaking, stand-up paddle boarding and more.